Ramírez and Hammers since a few years combine their artistic talents and materials. The results? Surprising! Astonishing! Remarkable! In contribution of the 1200th anniversary of Charlemagne’s death Rafael Ramírez Máro and Michael Hammers again combined their artistic talents in an installation titled originally in German „ Kaiser, Tod und Teufel“ (English: Emperor, Death and the Devil). Rafael Ramírez Máro´s painting interpretes the great emperor´s path through the valleys of death behind and around him - ultimately leading into his own death. The demon-like materiality of Michael Hammers burnt iron sheets transcend the painting into a physically touching reality. In his forge in Aachen Hammers burnt iron sheets in an archaic action closely to the monstrous state of complete destruction. The work intentionally commemorates the world famous engraving „Knight, Death and the Devil“ from 1513 by German artist Albrecht Dürer. 1200 years ago – on 28th January 814 – Charlemagne died in Aachen, having spent the last years of his life and his rule there in his most favoured and most important palace. In honour of his immense significance not only for the people of Aachen but also for the whole of European history, three major exhibitions will take place in Aachen in 2014 dedicated to the culture and courtly life of Charlemagne. The trio of exhibitions will be opened on 19th June 2014 by their official patron, the Federal President. 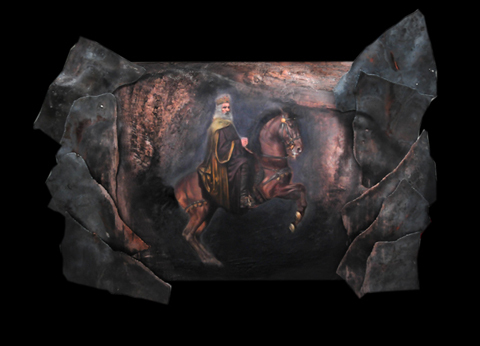 They will run from 20th June to 21st September 2014 in three prestigious venues – the Coronation Hall in Aachen’s Town Hall, the Centre Charlemagne on the Katschhof, and the Cathedral Treasury – and will present the impact, art and culture of Charlemagne. In addition to Aachen’s own historical collections, the exhibitions will be enhanced with an abundance of first-rate loan exhibits from international museums and private collections.